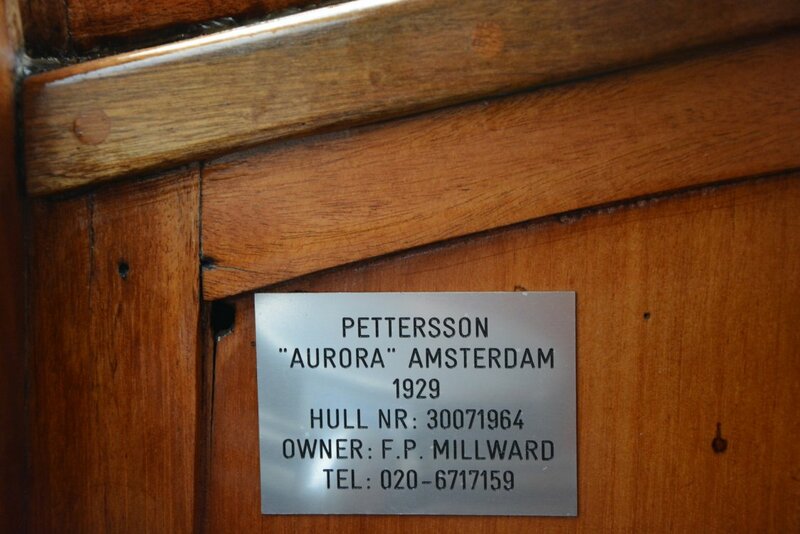 Pettersson Aurora uit 1929 te koop op Botentekoop.nl. Name: "AURORA" (previously "Pettersson 1929"
and "Dunnedoor II")Type: Pettersson motor yacht (Weekender type)Version: "Ruffmotorbät" (Tall straight bow with high freeboard and raised foredeck) with 'V' shape Transom stern.Design by: C.G. Pettersson (confirmed)Construction Number: 888 (tbc - no builders plate found)Commissioned and laid down: 1929 Stockholm, SwedenPowerplant: Bukh Marine Diesel DV20 ME - inboard 20 HP twin cylinder diesel engine (built Denmark 27.08.1976) Version: 022D0007 Engine Serial Number: 97000 Engine block Numer: 001E3113 (original powerplant: 6 or 8 HP Volvo Penta or Albin Petrol engine - tbc)Gearbox: ZF BW7 (previously BW6)Electrical System: 12 volt - dual batteryMax speed: 12 Knots (tbc) (original 8 knots)Hull skin: Honduras Mahogany, Oregon Pine, copper fastenings and caulking.Construction Method: Carvel on wooden ribs and stringers.Hull Type: S-bottom hullLength: 7.75 metersBeam: 1.75 metersFreeboard: tbcDraft: 0.65 meters (tbc)Displacement: 2 tonnes gross (tbc)Helm: Dual, wheel and tiller.Steering: Mechanical, chain and cable, and direct tiller/rudder connection.Berths: TwoSeas: Seagoing and seaworthy in up to moderate seas - coastal and inland waters. Designed for use around the Swedish (Inner) Archipelago (Skärgårdshavet) in the Baltic.Navigation Lighting: 1 (red) port light , 1 (green) starboard light, 1 (white)stern light, (1 (white)Navigational Instruments: 1 Sestrel Moore Steering Compass. Goedendag, Ik heb interesse in uw advertentie Pettersson Aurora. Kunt u contact met mij opnemen.